More than half of visits now come from mobile phones or tablets. If customers have to pan and scale and pinch and zoom to navigate, they’ll quickly decide to navigate away. 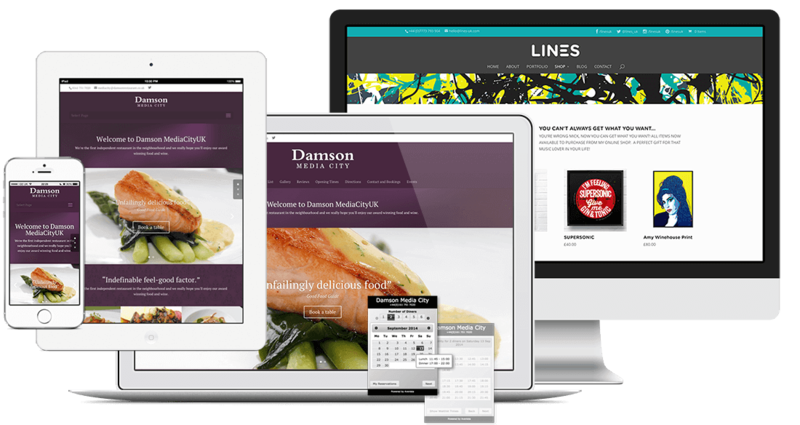 Nettl :commerce sites intelligently scale content to suit the device viewing. What does a Summer Sale banner say when it’s still there in January? Search engines reward fresh content, so keep adding products and make sure out-of-date content is removed. Product photography sells. 54% of consumers say they decided against a purchase because of unhelpful product photos according to Olapic & Fluid. And Instart Logic found 8 out of 10 retailers believe more images per product increase sales. It’s all about the customer. If they can’t find what they need, or get confused, they’ll drop their basket. BE the customer and anticipate questions they might have and make sure you’ve covered them. How do I return? Is delivery included? Make ‘call to actions’ big and bold. Tell ‘em what you want them to do next and don’t hide buttons in strange places. A well designed site should be easy to navigate, even if it’s in a different language. Would yours pass that test? Steve Jobs famously said “Real artists ship”. Waiting until the site is perfect before you go live, might be a mistake. Get it ‘good enough’, just start selling and then refine later. Better to make some sales than keep tweaking. Ecommerce sales psychology has moved incredibly fast. Trust your web designer to apply current best practice to your web shop and try not to let personal judgement influence layout and process flows – rely on customer data instead. Our very own Rob Finnie, regional director, looks at the top 10 website musts for 2015. 2014 was a shape shifter in digital marketing. If you’re in business in the UK – you can no longer afford to ignore online. In 2015, you may be taking your first steps to getting your business online or be ready to upgrade your site to take advantage of the seismic shift in online sales. This is priority number one for any new web project. 2015 will see more visits to websites via mobile and tablet devices than via desktops as ‘m-commerce’ hits its stride. Your site needs to adapt, scale and reflow to suit the device it’s being viewed on – or you risk turning your clients and potential customers off. Don’t delay your launch while you deliberate over the content or the budget. Sure, it’s important for your site to say the right things, but you can refine and change what it says once it’s live. Getting some content in and getting it live so search engines can start trusting you, is a benefit. If you don’t want to pay for it all at once, don’t. Most website developers will be happy to work to a ‘staged’ approach. Determine what is a ‘must have’ now and then plan what you think stage 2 or 3 might be. Good websites are never finished. They are always growing and changing. Benchmarking yourself against your competition saves you time and cost. Check out how you measure up before building your own site. And don’t be blinded by beauty; a website which converts visitors to buyers has a perfect balance of content, function, navigation and good looks. Keep prospects interested. Where do they want to go? What information do they need to take the next step? Plan their route through your website and lead them there. Only include relevant text, facts and imagery. Better still; watch a friend using your site. Ask them to find a specific product or information. You may be shocked at the results. If you’re creating a website to gather leads or interact with potential customers, make sure you’re clear on what you want your prospects to do. Calls to action help you monitor your conversion ratio. If you want them to contact you, show them how. Content is king… and queen… and emperor too. Ensure your site has relevant text which includes your key words. There are many tools, to guide you through the ‘on-site’ requirements to help your site rank well. Do it yourself, or get your agency to do it for you. Keep content concise and write for humans, not machines. Not only does it make Google happy, but it’s also a way to connect with your audience, state your views and keep prospects up to date on your activities and services. Link in your social media – the more connected you are the, wider your reach. Your site is live; it looks great, the message is clear – but that doesn’t mean people are going to find it. The design, build and launch are just the beginning. Plan how you are going to market your new site both online and offline. Get the message out via direct mail and leaflets as well as SEO. Canvas opinion of how your site works. Is the site portraying the right message, is it guiding prospects to take action with you? If it isn’t, change it. Test it. Monitor the analytics and make regular tweaks and changes to improve the customer experience. Ensure your site is built on strong foundations so it can grow with your business. You don’t want to have to start again and pay again just to add that feature you like. Don’t sit back and think ‘job done’. The best websites evolve and are updated regularly. Plan your next steps. www.nettl.com are offering £500,000 of web development grants to SMEs to help them get online in 2015. www.nettl.com is supporting small businesses with a free one-hour consultation for UK small businesses including a £500 grant for a Nettl :Commerce online web shop. Contact your local Nettl studio in Birmingham, Manchester, Dublin and London or for more details, see ww.nettl.com. As many as two million sole traders and small companies missed out on £1.5bn of Cyber Weekend online sales* according to the Department of Business, Innovation & Skills. With a greater number missing out on the last minute rush for Christmas and the January sales. As a result, www.nettl.com are offering £50,000 of web development grants to 100 SMEs to help them get online. The £500 grant on offer are designed to give smaller businesses the leg up they might need to start selling online. www.nettl.com, the new high street design studio, is supporting small businesses with a free one-hour consultation for up to 100 local small businesses in Birmingham, Manchester, Dublin and London and a £500 grant off a Nettl:Commerce online web shop before 30th January 2015. Many of the UK’s small and medium sized companies have so far missed out on the cyber spending in December due to their lack of online presence, and according to the Department of Business, Innovation & Skills more than half of customers (55%) say they find it hard to support local businesses when they simply can’t find them online. “Our clients tell us they know they need to sell online, but find it difficult knowing where to start. They hear about how expensive web development is and worry that they are going to get ripped off. It’s our mission to remove the black magic and mystery of ecommerce and help small businesses to just start selling online,” said Peter Gunning, CTO of Nettl. “We’re so confident that our web shops will make a difference that we’ll even offer clients the option to pay their website over 12 months, so that with just a few orders, they can cover their costs. If you are a small business in Manchester, Birmingham, London or Dublin, visit www.nettl.com to find your local studio and reference the £500 grants on offer. Black Friday and Cyber Monday sales saw a record £1.5bn in sales.